A former top general in Syria's chemical weapons program says he doesn't doubt for a moment that President Bashar al-Assad will deploy his chemical weapons arsenal as he tries to hold onto power and crush the uprising that started almost two years ago. "The regime started to fall and deteriorate. It's coming to its end," said retired Major General Adnan Sillou in an interview in a hotel near Antakya, on Turkey's southern border with Syria. "It's highly possible that he'll start using [chemical weapons] to kill his own people because this regime is a killer." He listed mustard gas along with the sarin, VX and tabun nerve agents as the main elements in Syria's chemical arsenal, whose existence Syria doesn't even acknowledge. Foreign intelligence officials and analysts have focused on the first three as the main threats, and last week U.S. officials said there was evidence sarin had not only been moved, but its binary components, usually stored separately, had been combined and placed into bombs for use. Sillou accuses Assad's forces of already spraying pesticides and dropping white phosphorous, claims also made by opposition activists. "They're idiots, crazy. Simply they are killers," he said. Sillou believes the regime could step it up to more serious chemical weapons if Aleppo, Syria's most populous city where fighting has raged for months, falls to the rebels. In July, Sillou left Syria for Turkey almost four years after he said he retired from the military. 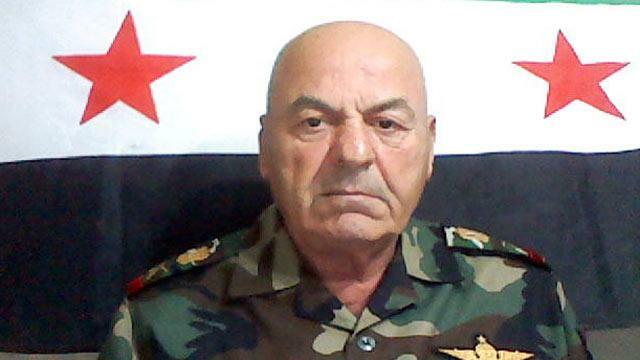 Sillou told ABC News that in his last post, which he held for six years, he was second in command behind a man named Said Ali Khalil, a member of Assad's ruling Alawite sect, an offshoot of Shiite Islam. After defecting, Sillou said he was debriefed by an Arabic-speaking agent from the Central Intelligence Agency in Turkey's capital, Ankara. The meeting lasted three hours and was the last contact he said he had with them or any other intelligence agency. Fighting is raging around the capital, Damascus, notably on the airport road where rebels are trying to take the airport to hamper outside support and deal a highly symbolic blow to the regime. The uptick in violence near the seat of Assad's power has raised American fears that he could resort to using his chemical weapons. President Obama and other world leaders have said their use would cross a "red line" and invite an as-yet undefined action, possibly military. But analysts have expressed skepticism that Assad is at the point where he needs to use chemical weapons and knows what the repercussions could be. "As long as he's trying to hold onto the country, I don't think he'll use them," said Joshua Landis, a Syria analyst and professor at the University of Oklahoma. "As long as he's in Damascus, strategically they're not helpful to him. It's a death warrant as soon as he uses them." "I don't think he's crazy, I think the generals around him are calculating," Landis continued. But "this danger from the rebels is one that could be extreme. Once [the regime gets] their backs against the wall, the chances of using them goes way up." The United States and its allies have repeatedly expressed concern that Syria's stockpile, believed to be one of the biggest in the world, could be stolen and fall into extremist hands if the facilities are overrun. Or, before that happens, they could be transferred to Hezbollah by a crumbling Syrian regime. "Syria has 600 chemical warheads apart from the liquid chemical substance which is being stored," said Sillou. "The bombs are easily transported from one place to another. To Hezbollah, which could be used against Israel, to [Shiite cleric] Moqatada al-Sadr in Iraq. The regime can give it to any friendly groups." "They are not safe at all," Sillou said of the facilities. Asked about the dozens of chemical weapons sites the U.S. believes to be spread across the country, he said the primary facilities are called 417 and 418, near Damascus and the third-largest city Homs, respectively. Sillou argued the arsenal was developed as a counterbalance to neighboring Israel's nuclear arsenal, an open secret not acknowledged by Israel. But he said they would only be used against external forces if Syria was attacked. The comment was similar with one by Foreign Ministry spokesman Jihad Makdissi in July who said chemical weapons would never be used against the Syrian people, just "external aggression." Makdissi is believed to have been sidelined shortly after that tacit acknowledgment of the chemical weapons' existence, and last week reportedly defected and left Syria. Just two people have the power to order a chemical weapons attack aside from Assad, Sillou said: the head of Air Force intelligence Jamil Hassan and head of state security Ali Mamlouk. However, "I don't think it will be used without [Assad's] consent," he added. Sillou is now hoping to mount a brigade called "Mountain Heroes," comprising some 2,000 men who would help secure the chemical weapons facilities. He says he has 15 chemical weapons officers ready to work with him and is calling for weapons and funding from the U.S.
"I have trained officers," he said. "I want [the U.S.] to support me with money, with advanced weapons to occupy these facilities and protect these stockpiles."